The residential dumbwaiter has seen many improvements in its design throughout its long history, and this unique invention continues to be useful to 21st century homeowners in a variety of ways. 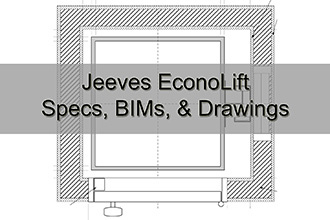 Today, Nationwide Lifts is proud to offer the Jeeves EconoLift. These dumbwaiters are simple and cost-effective and are available in two standard sizes, with custom sizes available. If you’re interested in making it easier to move objects between floors of your home, we can help you find the right residential dumbwaiter to suit your needs. What Is a Dumbwaiter Elevator? A dumbwaiter elevator is a very small freight elevator that’s intended to carry objects instead of people. Commercially, you’ll often find them in hospitals, restaurants, hotels, and schools. They’re now also a popular addition to the home, with dumbwaiter installation making it easier to move things upstairs and downstairs. Dumbwaiter Design and Function: How Are They Built, and What Can They Do? Our residential dumbwaiters are constructed of durable materials to ensure solid performance. The cab is made of birch plywood and has a roll-up gate. Birch plywood provides a sturdy foundation for the construction of our dumbwaiters for homes, and the roll-up gate offers an extra layer of security for the items transported in the cab. Landing doors are also available, but homeowners usually provide doors to match their home’s interior. People have many reasons to purchase a home dumbwaiter from Nationwide Lifts. Our dumbwaiters are designed to safely transport bags of groceries, bottles of soda, books, or even pieces of luggage to another floor. Homeowners can feel at ease about transporting valuable items in their residential dumbwaiter. The typical home dumbwaiter cost is between $9,000 and $12,000, depending on its exact specifications. Homeowners can contact us online or by phone to get a free price quote on the cost of a dumbwaiter lift; we can help you find the dumbwaiter that will satisfy your needs. We also have a free catalog that features specific details on all of our products. The specs and customization options for your particular order will affect the cost of a dumbwaiter lift. Contact us today and we’d be glad to go over the details with you. Dumbwaiters in the home can have a lot of different uses, but these are some of the most popular styles and ways to use dumbwaiters. Make laundry day less of a headache with a dumbwaiter. You can move your laundry baskets from the laundry room upstairs with ease. For some, carrying a basket up and down the stairs can be dangerous, so this can reduce hazards while speeding up the chore. Some people store firewood in their basement for a woodstove upstairs. It can be difficult and risky to transport firewood, so why not make it easier with a dumbwaiter that can carry logs from floor to floor? Like the name implies, these dumbwaiters are usually fitted into corners where they can be tucked out of the way while still adding convenience. In homes, you can often find them on countertops, where people might use them to transport things like bags of groceries. This dumbwaiter size tends to be smaller and inconspicuous, blending in with the furnishings of the room. A dumbwaiter in the garage can come in handy for transporting supplies and materials into the house. Whether you’re dealing with heavy tools, groceries from the car, or other household goods that aren’t easy to carry, the garage can be the ideal location for a dumbwaiter. For a senior dog or a dog with a disability, a dumbwaiter can make their lives so much easier. Don’t close off parts of your home to your furry friend: Install a dog dumbwaiter to help them get upstairs. Dog dumbwaiters are more open-air than other types, so your canine companion can ride in comfort. The standard residential dumbwaiter dimensions of our Jeeves lifts are either 20 inches wide by 20 inches deep by 30 inches high or 24 inches wide by 24 inches deep by 30 inches high. Custom sizes are also available, so you can choose residential dumbwaiter dimensions to fit your needs. The capacity of these home dumbwaiters is either 100 or 150 pounds. Their travel speed is 30 feet per minute, and they can travel as far as 50 feet, making up to six stops. When you buy a home dumbwaiter from us, our trained technicians will come to your home to install it. Our staff are knowledgeable about the different types and sizes of dumbwaiters, and residential customers can rely on our technicians to install their dumbwaiter in a safe and efficient manner. Furthermore, our courteous technicians understand the importance of installing a dumbwaiter and cleaning up the area in a timely way so family members can get back to their normal routine. Why Is it Called a Dumbwaiter? The dumbwaiter’s etymology is based on its function: It’s dumb, meaning silent, and a waiter, acting like a restaurant waiter or a servant to carry things from place to place. When dumbwaiters were invented, it was common to have household servants, and the dumbwaiter could perform some of their work for them. But unlike a human, a dumbwaiter isn’t seen or heard, hence its name. What Were Dumbwaiters Used For? Dumbwaiters were historically used to save household staff time and effort. They were mainly used to transport food and objects between floors in large houses, much like how dumbwaiters are used today.